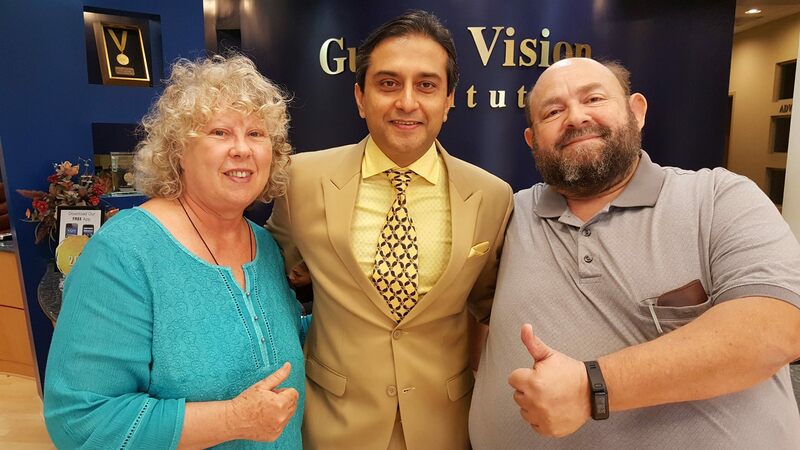 So here we are again, after our quick semi-annual visit to Dr. Gulani to make sure our eyes are still doing what they should - and why not? After all Dr. Gulani is a well-known miracle worker. Or is he? If you ask him he'd say no. Dr. Gulani is a teacher for other doctors, traveling world-wide to speak on how he works and why his work actually works when others have failed. He perceives that often he fails to reach the listeners, who have an investment in doing things a different way. Why, one might ask, when that different way is what's creating the situations Dr. Gulani then has to fix? Apparently Dr. Gulani, not content to challenge nature over the workings of one's eyes, is also challenging the nature of professional care. Let us hope he is as successful at this second challenge. It might be nice for him to have his pupils get their own reputation as miracle workers! One cannot escape Dr. Gulani's office without hearing tales from other patients who, in the words of the song, were blind but now they see. Why is this? Because Dr.Gulani takes the trouble to understand the camera and the person behind it. - Mark D.